Miniature sewing machine - Wertheim treadle 1. This delightful miniature chainstitch was produced by the Wertheim Company. The firm is better known for its domestic models, which were produced in Germany and Spain. 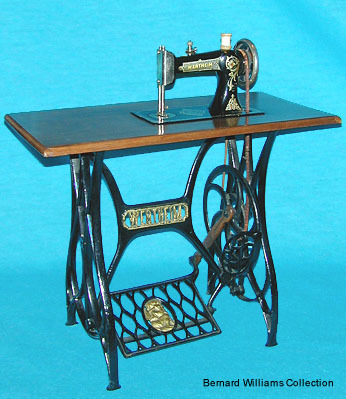 The treadle is too small, even for a child, therefore its original intended use remains something of a mystery. For a close up of the head, click here.